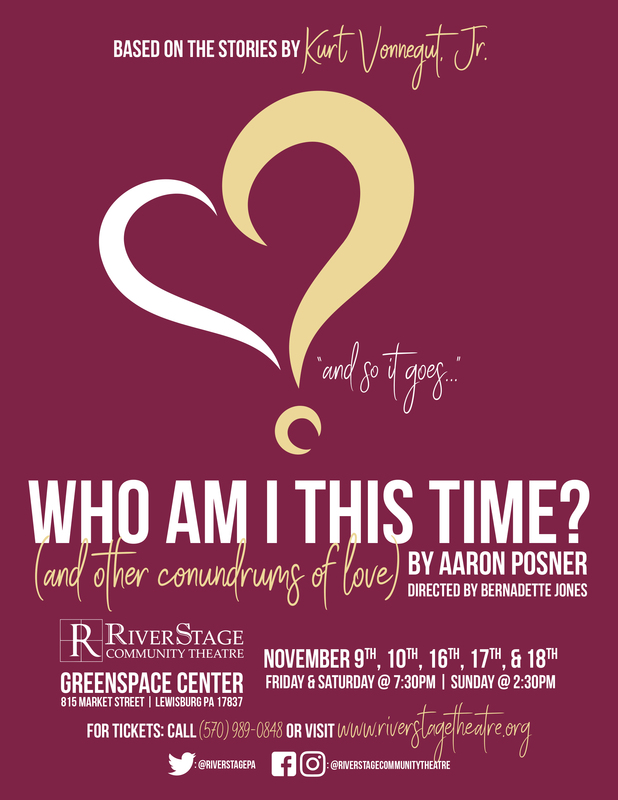 by Aaron Posner, based on stories of Kurt Vonnegut, Jr.
LEWISBURG – RiverStage Community Theatre will present the delightful, family-friendly comedy Who Am I This Time? (And Other Conundrums of Love) by Aaron Posner, based on three 1960’s era love stories by author Kurt Vonnegut, Jr. 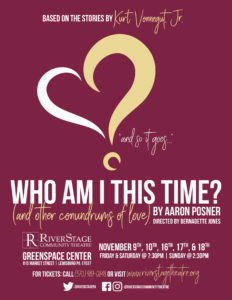 Performances will be held over two weekends, Friday and Saturday November 9th, 10th, 16th and 17th at 7:30pm, and one Sunday performance on November 18th at 2:30pm, at Greenspace Center, 815 Market Street in Lewisburg. All seating is general admission, tickets are $15 for adults and $8 for students/children with group discounts available and can be purchased at the door, by calling 570.989.0848 or at www.riverstagetheatre.org. Who Am I This Time? (And Other Conundrums of Love) by playwright Aaron Posner is a smart comedy appropriate for all ages, based on the short stories of Kurt Vonnegut. Set on the stage of a small-town community theatre, members of the North Crawford Mask & Wig Club (“the finest community theatre in central Connecticut”) use the magic of live storytelling to bring to life three early comic masterpieces by Vonnegut in an evening full of laughs, love and witty observations about the human condition. In the first story, “Long Walk to Forever,” a young soldier deserts his post to prevent his childhood sweetheart from marrying the wrong man. In “Who Am I This Time,” two shy residents of a town transform into red-hot romantics when rehearsing for a production of A Streetcar Named Desire, and in the final story, “Go Back to Your Precious Wife and Son,” a Hollywood screenwriter discovers that his marriage to a fading movie star isn’t everything he expected. This production of Who Am I This Time? features a cast of versatile local actors who have appeared in shows across the Susquehanna Valley. Tom Newton, a bathtub-enclosure salesman who narrates the three stories, is played by Jove Graham, and his wife Kate is played by Virginia Zimmerman. Ian Felker and Ellen McCormick, Desirae Mausteller and Justin Moore, and Pete Zerbe and Davena Laverty play the couples who are at the heart of each story, and they are joined on stage by other colorful characters played by Sarah Bell, Fred Hooper, Glenn Wilson and Maggie Able. Production design is by Peter Wiley, with lighting design by Stefan Eisenhower, and stage management by Sara Jones. “…as a night in the theatre, it’s easy to love.” —The Oregonian. “It takes love as its subject and handles it with the utmost skill…The overwhelming message, though, is one of hope, delivered with humor and heart…delightful.” —Willamette Week. “This delightful, lyrical piece of love and simpler times…delivers just the right amount of fun…more than a few belly laughs of a more home-spun Vonnegut quality. Audiences will find themselves enchanted and often laughing out loud.” —PortlandStageReviews.com.